Letters like this are many. But there was one mail which was a special request from Ms. Aruna Narayanan, San Jose, USA to have a study circle on Love. That in fact is the theme of the current episode. Swami singing "Love is My Form"
In fact love is universal, and all religions speak of divine love in the same wavelength. For example, the Bible says, ‘Love is patient, love is kind, it is not envy, it is not boasting, it is not proud, it is not self-seeking and it keeps no record of wrongs’. The Quran in Chapter 85, Verse 14 refers to Allah as Al Buruj which means, He’s truly forgiving and all embracing in His love. It also refers to the Almighty as Al Wadood which means that God Himself is infinite love and compassion. Now these may be very ‘difficult-to-understand’ definitions of love. So what I suggest is we start by expressing our own understanding and view point on love. And then we will see how we can relate these various viewpoints into that unified thought which Swami talks of as divine love. So why don’t we start with Giridhar. SG: I am reminded of a story which Swami narrated in the interview room to one of our brothers. 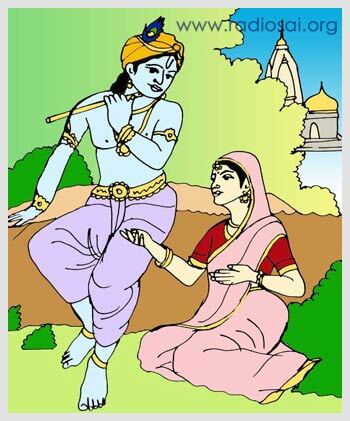 He takes us back to the Dwapara Yuga when Lord Krishna returns to Brindavan after many years and after meeting his parents, mother Yashoda and father Nanda, goes to the banks of River Yamuna to meet Radha. Radha told Krishna: "I don't want anything from You. 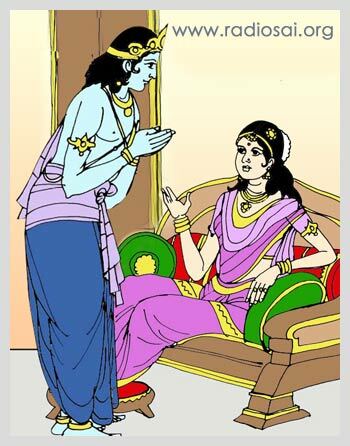 “Not even My love?” Krishna asked. KMG: Indeed, Radha’s love was the purest but frankly to verbalise what love is and what it means is next to impossible. To the best of my understanding, there is a very fundamental drive in all living beings which is - to seek happiness. Everyone wants to be happy and as Swami says ‘bliss’ is actually our true innate nature. When we experience that joy we’re in absolute harmony with ourselves which is the secret of contentment. Therefore, I feel love is an emotion or feeling that facilitates an ambience for this joy and happiness to spring out of our heart. That is why everyone seeks and thirsts for love. GSS: Bishu, what’s your take on this? BP: Let me put it slightly differently. I would like to refer to a story that was forwarded to me some time back. 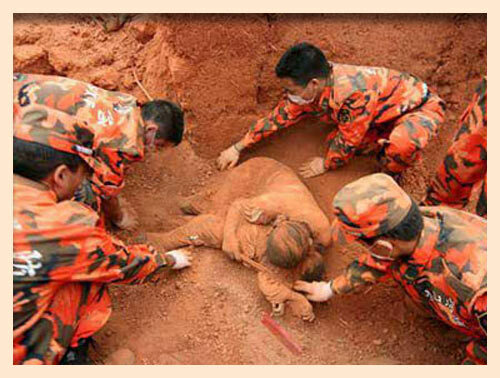 It is the story of a mother’s sacrifice during the earthquake that robbed the Sichuan province of China in May 2008.
during the earthquake in China, 2008. BP: Yes, it was alive! The mother had protected the child so well that the little one was blissfully asleep. Well, I do not know if that part of it is true, nevertheless that definitely is the unspoken message of that amazing mother. Now, imagine multiplying this sacrifice an unimaginable million times and what you probably get is a glimpse of love that is absolutely deep and tremendously touching – that is Divine Love. Now think of Swami. If we look at what He has done in His life, He has just given Himself completely to others. Even in the last few years I remember how He used to sit for long hours in the evenings, sometimes even up to 9 p.m. watching the programmes in the Sai Kulwant Hall and filling the cup of every devotee's heart with joy. I feel this zenith of unconditional affection, this pinnacle of sacrifice, this state of supreme selflessness is Love. GSS: Amey, what’s your understanding about this? SG: In fact Swami says that no parent today ever names their child after Kaikeyi. AD: Very true. So I think that is the kind of love that one must have. GSS: So it’s interesting to see the various aspects of love that we have talked about, love as giving and love as sacrifice. These are definitely the different characteristics of love but I am also trying to understand what love could be. Here I’m reminded of what Bhagawan says: “I separated Myself from Myself to love Myself.” Love is the cosmic glue that manifests during this great act of separation which ensures the ultimate union. So if God is like a divine magnet which separates itself into smaller magnets; love is this magnetic force which brings back and unites everything together. If we want to understand the word ‘religion’, see how beautifully Swami explains it. He says, “There is only one religion, the religion of love.” But religion actually originates from the Latin world ‘religare’. In essence, it means 'trying to unite the creation into one united whole'. At one point, Swami says, “Love transposes the self onto another and the two begin to think, speak and act as one. When love takes in more and more into its fold more and more entities are unified as one”. Expansion, Bhagawan says, is the very essence of love. So I feel the best way to go forward is to try to understand the manifestation of this love in various forms. Incidentally, it’s striking that the two of you spoke of mother’s love. And I guess mother's love is the one that comes closest to divine love. But let’s also try to understand the various other forms of love. For convenience, let's put them in the framework of Vyashti, Samashti, Srishti, and Parameshti. Firstly, we’ll talk of Vyashti Prema or love associated with individuals, then go on to Samashti Prema or love connected with the community, society and the nation, next we will move on to Srishti Prema or love associated with the whole of creation, i.e., Nature. Finally, we’ll discuss Parameshti Prema, or love associated with God. Now Vyashti Prema is of many types, we have moha, anuraga, etc. and Swami has extensively talked about all these. So why don’t we start with the word that is closely associated with love which is moha or attachment? There are a lot of things that we need to understand here. Is moha love or is love moha? Or are the two intertwined? Let’s begin our deliberations on this topic. Giridhar, what are your thoughts on this? SG: Once in Chennai, Swami had a session with a few of us where we were allowed to ask a few questions. One of our brothers asked, “Swami, akarshana ki moola karanam enti?” (What is the root cause for attraction?) He must have been impelled to ask this question as attraction as we all know, is the root cause for moha or attachment. then the mind goes after something else and the cycle repeats (MAD syndrome). GSS: There is flaw in our vision not in the creation. SG: In fact Swami said three words after that. “Drishti, Akarshana, Badha” almost giving a sequence of events. He explained that drishti is your perception because of which you are attracted to some things which is basically akarshana. He also used another word Korika which means desire. Swami said, “The moment you are attracted towards something, in your mind arises a korika or a materialistic desire. And if for some reason this desire is not fulfilled, then it leads to badha or disappointment and despair.” What a beautiful sequence of events as explained by Swami! Drishti leading to akarshana, korika and then badha. AD: Very interesting, in fact I really liked the way Rangarajan Sir put it calling love as the cosmic glue that binds everything. So I guess, moha is something that gives you an instant feeling but doesn’t last long. Here I’m reminded of an interesting syndrome prevalent in our hostel which we call the MAD or the Momentary Attachment Detachment Syndrome.